On 18 March 2013 in San Diego, California—the site of this year’s American Academy of Neurology (AAN) annual meeting—the Alzheimer’s Disease Neuroimaging Initiative (ADNI) steering committee gathered to exchange the latest developments in this $140 million public-private project launched in 2004. About two and a half years into its second phase (see ARF related news story), the initiative is homing in on earlier stages of disease. The combined cohort from ADNI 1 and ADNI 2 will contain 350 people with mild to moderate AD, 550 with amnestic mild cognitive impairment (now called “late MCI”), 300 with early MCI, and 350 controls. Enrollment is nearing completion, said Michael. Weiner of the University of California, San Francisco, ADNI’s principal investigator. Still needed are 40 more AD patients and 100 people for a new, even earlier cohort inspired by the Australian Imaging, Biomarkers & Lifestyle Flagship Study of Ageing (AIBL), called subjective memory concern (SMC). In terms of baseline profiles, the newly enrolled early MCI cohort seems to fit “clinically right where we hoped,” said Laurel Beckett of the University of California, Davis, who leads ADNI’s biostatistics core. People with early MCI have Mini-Mental State Exam scores between 24-30 and a Clinical Dementia Rating (CDR) score of 0.5, with no dementia or significant functional impairment. On magnetic resonance (MR) measures of brain volume and positron emission tomography (PET) measures of glucose metabolism, early MCI subjects look more like the controls than the cohorts with late MCI, Beckett reported. On florbetapir PET measuring brain amyloid load, less than half of the early MCI group exceeds the cutoff for amyloid positivity. With that, ADNI is shifting its attention toward even less impaired populations. “We are trying to move the clinical focus backward toward the very mild end of the spectrum. With an eye on a primary or secondary prevention trial, we want to stratify ‘normal’ people who may be on the road,” noted Ron Petersen of Mayo Clinic, Rochester, Minnesota, in an e-mail to Alzforum after the meeting. Petersen, together with Paul Aisen of the University of California, San Diego, heads ADNI’s clinical core. Thirty sites have received IRB approval to screen for this new SMC cohort, which got its first few subjects this past month. SMC is “meant to capture people who are ‘normal-ish,’” Petersen said. That is, they test as cognitively normal, scoring 0 on the CDR scale, yet have memory complaints registering as “mild concern” on the Cognitive Complaint Index used in Saykin et al., 2006 (see ARF related news story). Leslie Shaw, who co-leads ADNI’s biomarker core with John Trojanowski, both of the University of Pennsylvania, Philadelphia, reported that the ADNI 2 CSF samples collected up until just days before the meeting should be uploaded onto the ADNI data site in mid/late April. This batch contains 680 samples—358 from ADNI 2, 242 from ADNI 1, and 80 from the GO carryover phase of ADNI 1. “Quality control continues to be a high-priority focus,” Shaw said. His team is working to harmonize methods and qualify mass spectrometry methods for characterizing Aβ peptides (see ARF related conference story). As the number of manuscripts written using ADNI data soars above 600 and the number published pushes well past 350, it becomes critical to ensure that papers include sufficient detail for other researchers to reproduce results and compare them to other studies. Beckett presented to the steering committee a draft of reproducible research standards for ADNI publications. According to the new guidelines, authors need to provide a reproducible link for each source file they download from the ADNI data site. In addition, scientists must document all programming and statistical analyses with exact code or enough detail to replicate all steps of the analysis. “The pathway between program output and tables and figures in the paper needs to be transparent and reproducible,” the guidelines state. The plan is for these to be non-binding recommendations for some period of time, with a view to make them required in the long term, Weiner said. Atsushi Iwata of the University of Tokyo gave an update on the Japanese ADNI (J-ADNI), a longitudinal biomarkers study that closely parallels the U.S. initiative. Launched in 2007, J-ADNI finished enrollment at 545 participants in March 2012, and 90 percent of the visits have occurred. The MCI-to-AD progression rate is 16 percent per year, a bit higher than in the North American ADNI. In addition, J-ADNI scientists report a slightly higher CSF Aβ42 cut point. Last fall, the second phase (J-ADNI 2) received approval for Japanese funding equivalent to $5 million over the next five years. J-ADNI 2 plans to start enrolling for 100 people each with early and late MCI this summer, Iwata reported. In San Diego, Weiner also spoke about DOD ADNI, an analysis of brain aging in Vietnam War veterans funded by the U.S. Department of Defense. The study will use ADNI protocols to test if people with combat-related traumatic brain injury (TBI) and post-traumatic stress disorder (PTSD) are at higher risk of AD than control subjects without these conditions. Research on the consequences of TBI and PTSD has intensified in recent years (see ARF related news series; ARF related conference story; ARF news story on Goldstein et al., 2012). DOD ADNI researchers will look for the following biomarkers as signs of elevated risk: higher brain amyloid load, lower cerebrospinal fluid (CSF) Aβ, higher CSF tau and phospho-tau, faster brain atrophy, and reduced cognitive function. The scientists hope to enroll 195 U.S. veterans—65 with TBI but no PTSD, 65 with PTSD but no TBI, and 65 controls with neither condition. People with mild cognitive impairment (MCI) or dementia cannot participate. Given previous experience and expected dropouts, DOD ADNI plans to refer about 100 people for each of these groups to its 18 sites. Unlike in ADNI, individual DOD ADNI sites will not recruit subjects. Rather, the San Francisco VA Medical Center (SFVAMC) is handling this—a massive effort that has proven thus far more tedious than fruitful. Combing through VA compensation and pension records, SFVAMC last fall identified and mailed study brochures to thousands of veterans who met the broad criteria and live within 150 miles of a DOD ADNI clinic. The good news is that more than 350 subjects returned the reply card saying they would like to participate. The bad news: 168 declined once they heard more about the study in a follow-up phone call, and an additional 165 failed the initial screen. Excess metal in the body (e.g., from shrapnel, artificial joints, stents) makes MRI scans unsafe for them and accounted for a third of the screen fails. Another quarter came from people showing signs of both TBI and PTSD. DOD ADNI may end up enrolling some of these folks after all as part of a new cohort, given the slow recruitment thus far, Weiner said. At present, the study has enrolled 14 veterans; it needs about 180 more in the next 12-18 months. To speed things along, DOD ADNI will hire additional recruitment staff and front-load critical information and questions to the early part of the phone screens. During the first few minutes, phone screeners will mention the lumbar puncture and other study details that tend to prompt declines, and ask about metal in the body. The advantage of the new approach is that a centralized phone bank performs much of the initial screening, which should reduce screen fails once the subjects arrive at the sites, Weiner said. Meanwhile, sites need to gain approval from the Alzheimer’s Disease Cooperative Study (ADCS). This process is also taking longer than expected because of additional steps and signatures required to certify the functional magnetic resonance imaging (fMRI) add-on to ADNI’s existing MRI protocol. Some sites will also collect diffusion tensor imaging (DTI) MRI data. Ken Marek of the Institute of Neurodegenerative Disorders, New Haven, Connecticut, briefed the San Diego audience on the Parkinson’s Progression Markers Initiative (PPMI). This initiative launched in 2010 with goals and a design similar to ADNI’s (see ARF related news story), and some shared core personnel. PPMI now includes 24 clinical sites in the U.S., Europe, and Australia. Thirteen industry sponsors have committed approximately 30-40 percent of the $55 million needed for this initiative. The primary sponsor and funder is the Michael J. Fox Research Foundation for Parkinson’s Research. To date, PPMI has had more than 50,000 data downloads worldwide and 21 requests for biologic specimens. “We are on the cusp of enrolling the full cohort,” Marek reported. At present, PPMI has more than 90 percent of its planned participants—400 people with newly diagnosed PD, 200 healthy controls, and 80 people in a newly added “SWEDD” (Scans Without Evidence of Dopaminergic Deficit) cohort. SWEDD subjects have PD-like symptoms but show normal dopaminergic brain scans, suggesting they are unlikely to have PD, Marek said. Reduced striatal binding of dopamine transporter (DAT) on SPECT imaging is required for entry into the PD group; however, about 15 percent of people screened for PD eligibility in PPMI have not met this requirement. In 2011, PPMI announced it would enroll these individuals and follow them for two years in order to compare their clinical and biomarker changes to PD patients with abnormal DAT imaging and healthy controls. Unlike ADNI, PPMI participants must agree to lumbar punctures right from the get-go for CSF measurements at baseline and follow-up visits at six, 12, and 24 months. So far, this requirement has not hindered recruitment. Scientists have succeeded in getting CSF measurements in more than 97 percent of the participants at baseline, and 85-90 percent at six and 12 months, Marek reported. PPMI has just started enrolling a prodromal cohort. In addition, it will begin recruiting LRRK2 mutation carriers this summer. Eventually, 500 LRRK2 subjects in PPMI will constitute the longitudinal study that was previously part of the LRRK2 Cohort Consortium (see ARF related news story), Marek told Alzforum. These 500 will be followed for three to five years, just like other PPMI subjects. The scientists plan to start collecting baseline data in July, Marek said. 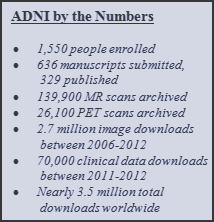 Incidentally, ADNI’s data site has gotten a makeover, with a cleaner interface and new content, including data and samples overview tables (see MR Image Data page), ADNI 2 study updates, and more information on software and parameters, said Arthur Toga of UCLA, who heads ADNI’s informatics core. The ADNI biostatistics core will hold the first session of a two-part online training on the use of ADNI data on Thursday, 4 April 2013, 8-10 a.m., PDT. The session will cover the basics of ADNI, including a brief overview of the study, navigation of study-related websites, data downloads, and use of visualization tools available on the LONI website. The training will emphasize where to find study details and how to make use of available resources. To register, please contact Naomi Saito. In the ADNI spirit of collaboration and data sharing, slide presentations from the steering committee meeting are available on the ADNI site.—Esther Landhuis. Saykin AJ, Wishart HA, Rabin LA, Santulli RB, Flashman LA, West JD, McHugh TL, Mamourian AC. Older adults with cognitive complaints show brain atrophy similar to that of amnestic MCI. Neurology. 2006 Sep 12;67(5):834-42. PubMed. Goldstein LE, Fisher AM, Tagge CA, Zhang XL, Velisek L, Sullivan JA, Upreti C, Kracht JM, Ericsson M, Wojnarowicz MW, Goletiani CJ, Maglakelidze GM, Casey N, Moncaster JA, Minaeva O, Moir RD, Nowinski CJ, Stern RA, Cantu RC, Geiling J, Blusztajn JK, Wolozin BL, Ikezu T, Stein TD, Budson AE, Kowall NW, Chargin D, Sharon A, Saman S, Hall GF, Moss WC, Cleveland RO, Tanzi RE, Stanton PK, McKee AC. Chronic traumatic encephalopathy in blast-exposed military veterans and a blast neurotrauma mouse model. Sci Transl Med. 2012 May 16;4(134):134ra60. PubMed.